The Leica X1 is a 12.2 megapixel compact camera with a 36mm fixed lens and a 2.7 inch LCD screen. The X1 has an APS-C sized, 23.6x15.8mm CMOS sensor with a 3:2 aspect ratio, which promises to deliver similar image quality to a DSLR camera. The image-stabilized Leica Elmarit 24mm f/2.8 lens provides a focal length of 36mm in 35mm terms, and there's a full range of advanced controls from manual exposure to manual focus. Other key features of the Leica X1 include a sensitivity range of ISO 100-3200, maximum shutter speed of 1/2000th of a second, JPEG and DNG RAW file support, and a continuous shooting rate of up to 3 frames per second. The recommended retail price of the Leica X1 is £1395 / $1995 / €1550. The Leica X1 is a beautifully designed and highly intuitive camera that looks like a miniaturized version of the M9 rangefinder, with some really well-thought out external controls that make taking a picture an easy and enjoyable process. The classic Leica styling is present and correct, with the famous logo, textured leather body, excellent lens and a range of luxury optional accessories all adding to the impression that this is much more than just another digital camera. As you'd expect with Leica, the cost of ownership is also indicative of the X1's exclusivity, with the eye-watering £1395 / $1995 / €1550 price tag putting it into direct competition with some serious DSLRs. Only the truly dedicated or well-heeled photographers need apply. Measuring 124(W)×32(H)×59.5(D) mm and weighing 286g, the X1 will just about fit into a coat pocket or small camera bag, but it's much too big and bulky for a trouser or shirt pocket, primarily because of the lens housing which protrudes quite a long out from the front of the camera body. The X1 becomes even more cumbersome if you add the optional optical viewfinder or handgrip, so don't buy the X1 thinking that this is a camera that you can easily carry with you at all times. Utilising an all-metal body, the X1 is an exceedingly well built camera with an under-stated all-black appearance with subtle gunmetal grey accents. Together with the slightly heavier weight this lends the camera a professional look and feel. The all-metal tripod mount directly inline with the centre of the body is another giveaway sign that this is intended to be a serious camera (most compacts have a plastic mount squeezed into one of the corners). The textured surface of the body makes the X1 quite easy to get a firm hold of, but if you're not satisfied then the optional handgrip is definitely worth considering, albeit at an additional cost of £90 in the UK. At the heart of the Leica X1 is the APS-C-sized image sensor with a 1.5x crop factor. The exact size of the image sensor used in the X1 is 23.6x15.8mm, much larger than the 1/1.8inch to 1/2.5 inch image sensors used in other compact digital cameras and also the sensors used in Micro Four Thirds models. And just like a DSLR, the X1 offers both JPEG and RAW recording formats, one of a handful of compact cameras to do so. There are 2 different JPEG compression levels which are recorded in the 3:2 ratio. The RAW files are saved in the Adobe DNG format, a clever move which means that you can open the X1's RAW files in any RAW file editor without having to wait for them to update their support - Leica even provide Adobe Photoshop Lightroom as a free download for X1 owners. Unfortunately you do have to wait for the X1 to process images, especially RAW files, taking around 2 seconds to store the first one then even longer to process the next couple, during which the camera can't be used. This isn't anywhere close to DSLR-like performance, despite Leica marketing the X1 as a real DSLR alternative or backup camera. There's even a 1 second lockup when shooting in JPEG mode at full-size, so when you factor in the slow auto-focus system (more on this below), this makes the X1 ill-suited to quick moving subjects. The 36mm, F/2.8 lens dominates the front of the X1. Leica, with its long history of making superb high-quality lenses for its own and other manufacturers' cameras, has developed this lens specifically for the X1. Despite offering a fixed-focal length, the lens extends by approximately 3cms when the camera is turned on, accompanied by a quite audible mechanical noise. The construction of the lens feels rock-solid with no play at all in the metal lens barrel. Note that there is no accessory ring on the lens barrel so you can't mount traditional filters on the X1. Image stabilization can be toggled on and off via the Main Menu. Obviously in these times of ever-increasing zooms, the fixed-focal 36mm lens will immediately put a lot of people off the X1, but 36mm is a great focal length for candid street photography, providing a classic angle of view that many photographers will find instantly appealing. The combination of the X1's lens and every photographer's constant companion, their legs, proves to be more versatile than you might first think. The large APS-C sensor, ISO range of 100-3200 and the maximum aperture of F/2.8 makes it easy to both blur the background and take sharper images in low-light without having to resort to using a tripod. Also on the front of the X1 is a small porthole to the left of the lens (looking from the front) for the helpful red AF assist lamp. Turning to the top of the Leica X1, we find an ingenious pop-up flash that rises out of the camera when you gently press the top of it. There's a little bit of side-to-side movement when it's raised, but nothing to get too concerned about. It's not the most powerful flash in the world, really only useful for fill-in purposes at short-medium distances, but there are an extensive range of creative flash modes available. If you need a more powerful flash unit, the adjacent external hotshoe accepts the optional SF24D and SF58 flashguns. The three other controls that complete the X1's top-plate form the creative heart of this camera, providing quick and easy access to the shutter-speed, aperture and continuous shooting options. A large thumb-operated dial for the shutter speed and smaller dial for the aperture are a real breath of fresh air, although they aren't quite as easy to use as the front and rear control dials that some DSLRs offer, especially when holding the X1 up to your eye (if you're using the optional viewfinder). Still, we'd much rather use this innovative dial system rather than the menu driven systems of most other compact cameras. The small but responsive shutter-release button is encircled by a lever that turns the camera on and off and enables you to select the continuous shooting speed of 3fps as well as the self-timer options (2 or 12 seconds). The rear of the X1 has quite a traditional feel, with the 2.7 inch LCD screen is a good compromise given the overall size of the camera, being small enough not to overpower the rest of the design, but large enough to easily frame and review your images. The 230,000 pixel resolution is disappointing though, given the cost of the X1 - we'd have expected a much higher-resolution screen. There are five options for increasing or decreasing the brightness of the screen if you don't like the default setting. If you'd prefer using an optical viewfinder to frame your images, Leica offers the optional 36mm Bright Line Viewfinder, which fits into the flash hotshoe on top of the camera. This system does give you a choice, but it comes at the cost of not being able to use the optical viewfinder and an external flashgun at the same time, and also the hefty literal cost of £250 (significantly cheaper if purchased in kit form with the camera). The viewfinder is a very tight fit in the X1's hotshoe, so there's no danger of it falling off, although it's small enough to misplace when taken off the camera. The viewfinder offers a large, bright view of the scene in front of you, but it doesn't provide any feedback to the photographer, other than showing a thick white border which indicates very approximately what part of the scene the camera will capture. I found that the recorded image wasn't precisely inline with this border, and also that it disappeared against a bright background, effectively making framing your subject something of a a point and hope experience. Also the only way of knowing that the camera has focused correctly is the small green LED above the LCD screen, which you can just see out of the corner of your right eye when looking through the optical viewfinder. Along the left side of the LCD screen is a column of five buttons which provide direct access to some key settings - image playback, image delete and focus modes, white balance, ISO speed and the amount of on-screen information displayed. 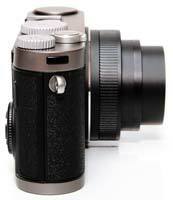 To the right is a thumb-operated dial which sets the manual focus, if that focusing mode is enabled. An enlarged version of the screen is shown in the middle of LCD screen with a horizontal distance scale underneath. It's a slow but effective system that's best suited to tripod-mounted photography, although the X1's disappointing 30cm macro mode precludes any really close-up encounters. Underneath the thumb wheel is a traditional 4-way navigation pad which allows you to set the exposure compensation, flash mode, auto or manual focus, and the self-timer options (in conjunction with the top lever). There's a self-explanatory Set / Menu option in the centre. The navigation pad is surrounded by a circular dial which allows you to quickly move through on-screen options and zoom in and out of an image during playback. Small LEDs for the auto-focus and processing complete the rear of the X1. Large metal eyelets for the supplied strap are positioned on either side of the body, along with a shared USB and HDMI compartment on the right, With no movie mode at all offered by the X1, we're not quite sure why Leica included a HDMI port. On the botton is the afore-mentioned tripod mount and the memory card / battery compartment. 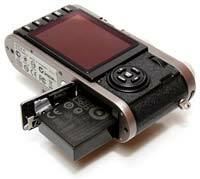 The X1 uses SD / SDHC / SDXC cards and has a battery life of around 250 shots. The start-up time from turning the Leica X1 on to being ready to take a photo is fairly quick at around 1.5 seconds. In the fastest Continuous mode the camera takes 3 frames per second for 6 images at the highest JPEG image quality, and commendably in RAW mode too, which is pretty good for this class of camera. Unfortunately, the X10 locks up completely for around 6 seconds when shooting a burst of Fine JPEGs and even longer for RAW files, so while you can certainly capture 6 JPEGs or RAW files in 2 seconds, the camera is effectively out of action for the next 6-10 seconds. The X1 has three metering modes, Evaluative Metering, Center Weighted Average Metering and Spot Metering. I found that it got exposures right 95% of the time when using the Evaluative Metering mode, with Spot Metering useful for the remaining 5%. Exposure compensation can be set in 1/3 stop increments from +3.0 to -3.0 stops and an auto bracketing function is also available. Auto focusing is one of the weakest points of the X1. There are 1-point or 11-point focusing modes to choose from, with so-called High Speed versions of each mode, plus Spot and rather curious Face Detection options. Traditionalists will find it easier and quicker to set the focus to the 1-point mode, then focus by half-pressing the shutter button and recompose the frame for off-centre subjects, whilst the 11-point system automatically sets the focus point that the camera thinks is most appropriate. The Spot option is useful for macro subjects, while the Face Detection mode feels completely out of place on such a manual camera. Unfortunately, all of the X1's auto-focus modes are compromised by the lethargic nature of the AF system. It isn't exactly what you'd call snappy, especially in low-light, always locking onto the subject eventually but with a noticeable delay that doesn't make this camera particularly good for action photography. This isn't good news for a camera that would otherwise be a great tool for street photographers, or for anyone that wants to capture moving subjects like children or sports. Combined with the camera's lack of snap in processing images, this makes the X1 best-suited to static subjects and a slower, more considered approach. The main menu system on the Leica X1, accessed by pressing the Menu/Set button in the middle of the navigation pad, is rather rudimentary but simple to use. There is a single long list of 34 options, such as image size, sharpness, metering mode and continuous mode. Thankfully the camera remembers the last menu option that you accessed, but having to scroll through such a long list every time you use the Main Menu quickly becomes tiresome. Due to the large LCD screen and restricting the number of on-screen choices to 7, the various options and icons are quite clear and legible. Once you have captured a photo, the Leica X1 has a very limited range of options when it comes to playing, reviewing and managing your images. You can slowly scroll through the images that you have taken, view thumbnails (16 onscreen at once), zoom in and out up to 8x magnification, turn detailed settings information about each picture on and off, such as the ISO rating and aperture / shutter speed, and including a small brightness-based histogram, which is also available when taking a picture.